Review: Battle Lines by Jonathan Fetter-Vorm and Ari Kelman – Escape Reality, Read Fiction! 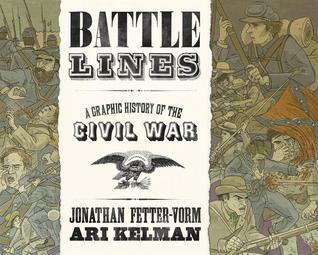 The graphic novelist Jonathan Fetter-Vorm and the award-winning historian Ari Kelman team up to create a unique portrait of a brutal and defining event in American history: the Civil War. The result is Battle Lines, a monumental graphic history—rendered in Fetter-Vorm’s sweeping full-color panoramas, and grounded in Kelman’s nuanced understanding of the period—offering a series of wholly new perspectives on the conflict that turned this nation against itself. Each chapter in Battle Lines begins with an object; each object tells its own story. A tattered flag, lowered in defeat at Fort Sumter. A set of chains, locked to the ankles of a slave as he scrambles toward freedom. A bullet, launched from the bore of a terrifying new rifle. A brick, hurled from a crowd of ration-starved rioters. With these objects and others, both iconic and commonplace, Battle Lines traces a broad and ambitious narrative from the early rumblings of secession to the dark years of Reconstruction. 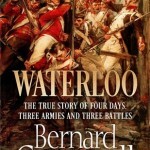 Richly detailed and wildly inventive, its stories propel the reader to all manner of unlikely vantages as only the graphic form can: from the malaria-filled gut of a mosquito to the faded ink of a soldier’s pen, and from the barren farms of the home front to the front lines of an infantry charge. Beautiful, uncompromising, poignant, and utterly original, Battle Lines is a daring vision of the war that nearly tore America apart. Note that the subtitle for this is “a Graphic History of the Civil War” and not anything like “the Complete History” or “the Comprehensive History”, because it isn’t either of those. Instead, Battle Lines is the history of the Civil War told in a series of snapshots. 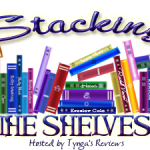 Each chapter illustrates the history of one found and commonplace item, as seen through a short graphic story of what the thing is and how it got to be part of the history of the Civil War. The snapshots usually show the story of someone equally commonplace, or someone who would be commonplace except for their intersection with the War. These are stories of regular people who are in uncommon and usually unpleasant situations. It is a refreshing change from all of the histories of the war as it appeared to generals and statesmen, or even to upper and upper middle class observers. These objects and these individuals tell the story of the war as it felt on the ground. It brings the tragedy of the war down to a human level, and the graphics make the reader feel. The thinking comes later – but it certainly does come. The graphic stories relate things and incidents that are known, but are generally seen at a more strategic and less visceral level. The chapter on Andersonville Prison is stunning and heart-breaking. We all know from reading even a cursory history of the Civil War that conditions at the POW camp were brutal and degrading. In this graphic history, we see it from the prisoner’s side, as a diary is passed from one prisoner to another, as each one goes through the cycle of initial internment through grinding hunger and despair to sinking into oblivion and death, only for the diary to be found and continued by the next inmate/victim. Although the Andersonville chapter sorrowed me deeply, the one that gave me the biggest chills was the one about the draft riots in New York City in July of 1863, 152 years ago this month. The draft could be avoided by paying a fee, and many, but not all, rich people paid to stay out. So the draft affected the immigrant population, who took out their frustrations on a readily available target – the free blacks who lived in NYC, as well as federal institutions. The scenes of death and destruction, and of mob violence aimed at non-threatening targets out of hate and fear, are utterly chilling. This chapter is told from three perspectives: the immigrants participating in the riot, the rich family who act as if it is none of their business, and the black families trying to protect their children from the mob. The story in Battle Lines starts from an attempt to show the flash points that caused the Civil War, both from the direct military standpoint at Fort Sumter, and the court cases and laws that built the cause of abolition. The denser history is conveyed through short but compelling and accurate newspaper article type pages that tell a lot of history with succinct exposition. For the background history, it helps to already know at least the outline of the causes of the War, but then, most Americans have had this in school, probably multiple times. The narrative ends with a chapter about Reconstruction and the rise of the KKK and the white supremacists in the post-Reconstruction South. Just because the official battles were over, it did not mean that hostilities had in any way, ceased. Reality Rating A-: Anyone who is looking for an accessible history of the Civil War will want to read this book. It is not comprehensive, but the graphic stories make the reader feel the War. It is not a view from 1,000 feet. Instead, it is a view from the muddy, bloody ground. For a war that still inspires so much passion, it helps the understanding to experience, even vicariously, some scintilla of what the participants might have felt. Even through the glass darkly. While the format makes it difficult to convey large pieces of complicated history, such as the parts about the causes of the war, when it reaches for one single illuminating article, it works incredibly well. These stories and these pictures feel true, even though they are made up of amalgams of personal accounts and histories rather than simply illustrating a single one. And we know what the Civil War looked like because there are so many photographs. 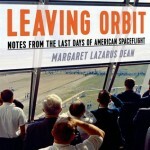 One of the chapters of the book shows the creation of one such photograph, and it feels like we are there. If you need to tell someone what the Civil War was, and most importantly, why it still matters, hand them this book.